Moira Cue is reviewing, in no particular order, every Pulitzer Prize winning novel ever written. The Road won the Pulitzer Prize for fiction in 2007. Also in 2007, the Hollywood adaptation of Cormac McCarthy’s “No Country for Old Men” won four Academy Awards. 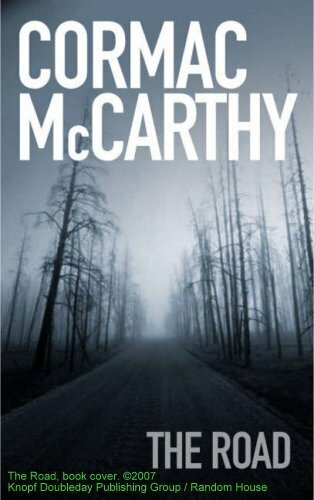 Prior to that, in 2000, McCarthy’s “All the Pretty Horses” was released as a feature film starring Matt Damon and Penelope Cruz, directed by Billy Bob Thornton. I read The Road in one day, before and after work and during lunch. Once I started reading this book, I didn’t want to stop. The most wonderful quality of fiction is its ability to transport the reader into another world. For me, the “real” world outside the book ceases to exist, and I find myself someplace else. In this case, the place where the story takes place is a post-apocalyptic world which seems to be about a decade after the collapse of global civilization and the nuclear holocaust. Stored food has mostly disappeared; there are few animals that are not extinct, and the remaining humans have taken to cannibalizing each other to survive. The Road was released as a feature film earlier this year, starring Viggo Mortensen, who plays the character of the father of a young boy, born after the world collapsed into an uncertain future. The boy’s mother, played by Charlize Theron who very briefly appears in the film, is only a memory the father holds dear. She chose suicide rather than risk being captured, and who knows what else by the men whose hearts were overtaken by evil. The father and son are trying to get to a warmer place, traveling South for warmth, and West to the sea, although the father knows all along that he is dying. He has a map and a shopping cart. They travel along a road, with binoculars and a rear view mirror, always on the lookout. The father carries a pistol, starting out with only three bullets. They search for abandoned stores and houses where they can find any remaining canned food items. Most of the time they starve; occasionally they get lucky. But there are threats, in the form of bad guys. The bad guys carry hand fashioned weapons like pipes and chains, using some of their captives as slaves and others as food. Harrowing images abound. Reading this book, entering this world, and then stepping back into “reality” the real world seems too bright, too easy. Even the bums living under the underpass to the freeway have it easy compared to the people in this world. The characters’ hunger and hyper vigilant alertness is contagious. Your heart races when they hear the crackling of leaves, or see smoke, or open a door. When they arrive at what is ultimately the end of the road, your heart breaks with theirs, and through the tears, along with the little boy, you hold out a hope, for goodness. And then the story is over, and you are left to wonder if one of the characters they’d met was right—the one who said that before the apocalypse (although they never use the word) he knew this was coming. You have to hope, for the sake of all the world’s children, that human ethics evolve along with our technological capacity for destruction—so that a worst case scenario can be averted.